One of the most anticipated attractions at Diagon Alley in Universal Studios Florida is the Gringott's Bank. Owned by the merciless and grouch goblins who are in charge of all wizard's vaults, the bank will be a rollercoaster adventure in the new expansion. The centerpiece of the new Harry Potter-themed area at Universal Orlando Resort will take visitors into Gringotts Bank to help retrieve a magical object and re-create a scene from the wildly popular book and movie series. Universal executives announced Tuesday that the ride will be called "Harry Potter and the Escape from Gringotts." The ride and the themed area will open in the summer. Among the features of the new ride: a 60-foot dragon atop Gringotts Wizarding Bank, a labyrinth of Gringotts vaults and a marble hall with goblins. "Harry Potter and the Escape from Gringotts will change the way you think about theme park attractions," said Mark Woodbury, president of Universal Creative. "We’ve created an entirely new type of ride that propels guests into the story like never before, and guests will remember it long after their visit to Diagon Alley." The ride will use 360-degree themed sets, digital high-definition animation, 3-D projection systems and live special effects. The new themed area will be located at the Universal Studios park. Courtesy of Orlando Sentinel. A video accompanying this information can be found at the link. The outside of the attraction will be topped by a 60-foot-tall, fire-breathing dragon figure. Inside, the attraction's queue will include a stretch in the marble lobby of Gringotts. Guests, according to the story, will be there to open an account at the bank. Their journey will go many miles below London toward the institution's vaults, Coup said. Riders will encounter Death Eater Bellatrix Lestrange and Lord Voldemort. "The guests will find themselves transported smack in the middle of the action when Ron, Harry and Hermoine break into the bank," Coup said. 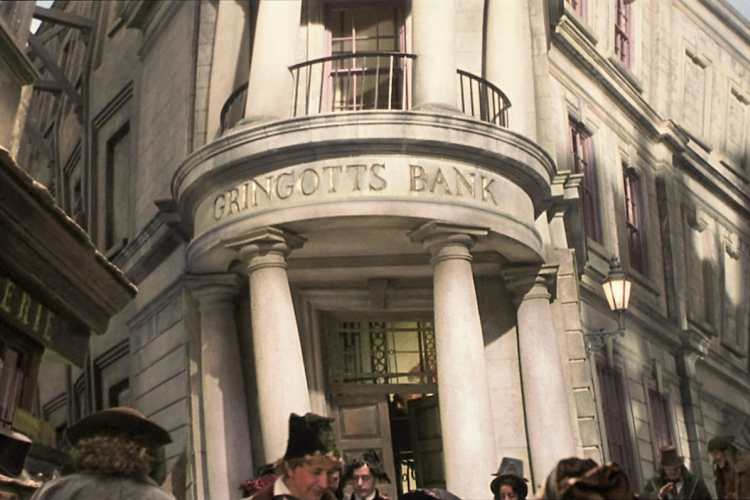 In the Potterverse, Gringotts is a goblin-owned bank for wizards. It was portrayed in rollicking fashion in the films, which have grossed more than $7.7 billion at the box office worldwide. Fans have clamored for a Gringotts ride for years, Coup said. "It's definitely something that we knew that everybody wanted," he said. "The second we started sketching ideas it was definitely going to be Diagon Alley and Gringotts Bank."